At LIGNA 2011, KUKA Roboter GmbH is presenting the new QUANTEC product generation, the KUKA.WorkVisual software platform and the KR C4 robot controller, which is set to simplify automation in the wood industry. 05/31/11, 02:56 PM | Industrial Robotics | Schneider Packaging Equipement Inc.
Schneider Packaging Equipment Co., Inc., specializing in end-of-line solutions for case packing and palletizing needs, is honored to announce Chris Hoover and William Carolan have successfully completed training and received professional certifications from Fanuc Robotics. Chris Hoover received Fanuc Certified Service Engineer certification, and William Carolan received Fanuc Master Service Engineer certification, Fanucs highest level of engineering certification. 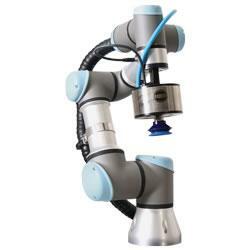 Stäubli Robotics, manufacturers of high speed and precision robots for industrial applications, was a major attraction at this years AUTOMATE show in Chicago. Among the highlights at the Stäubli booth was a raffle for a complete RS40B CS8C 4-axis SCARA robot system, which went to lucky winner Dorothy Williams from Kellogg Company. 05/25/11, 11:02 AM | Industrial Robotics | Schneider Packaging Equipement Inc.
Schneider Packaging Equipment Co., Inc., specializing in end-of-line solutions for case packing and palletizing needs, has appointed two new personnel effective immediately. Moog Inc. (NYSE: MOG.A and MOG.B) announced today that it has acquired Animatics Corporation. The purchase price is approximately $25 million consisting of 467,749 shares of Moog Class A stock (based on a 30 day average price of $42.76) and $5 million in cash. Animatics, founded in 1987, is a leading supplier of SmartMotor™ servo motors and linear actuators used in industrial applications. Animatics had trailing 12 month revenues of $15 million. North American robotics companies enjoyed their best opening quarter since 2007, according to new statistics released by Robotic Industries Association (RIA), the industry's trade group. The Associated Press is reporting that two PackBot ground robots from iRobot have entered Unit 1 and Unit 3 of the crippled Fukushima nuclear power plant and performed readings of temperature, oxygen levels, and radioactivity. The data from the robots, the first measurements inside the reactors in more than a month since a massive earthquake and tsunami damaged the plant, revealed high levels of radioactivity -- too high for humans to access the facilities. The remote-controlled robots entered the two reactors over the weekend. Details of the mission -- such as what areas of the reactors the robots inspected and from where they were operated -- are still scarce, but Tokyo Electric Power Co. (TEPCO), the plant's operator, said that the robots opened and closed "double doors and conducted surveys of the situation" inside the buildings.